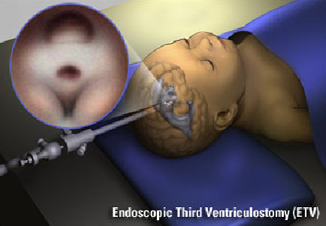 Endoscopic third ventriculostomy is an alternative surgical procedure that creates a bypass for the cerebro-spinal fluid in the head that eliminates the need for a shunt. It is helpful only to people with hydrocephalus that is caused by a blockage of the flow of cerebro-spinal fluid. 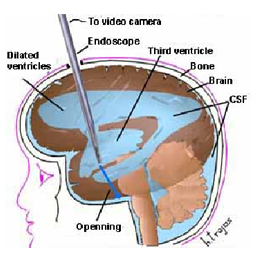 During this procedure the surgeon creates a small hole in one of the ventricles in the brain. This allows the excess fluid to drain away from the brain, and then be absorbed by the body. Third ventriculostomy refers to the area of the brain where the bypass is made. Because the most common site of blockage is the narrow pathway between the third and fourth ventricle of the brain (the aqueduct of Sylvius), the bypass is made through the thin membrane in the bottom (or floor) of the third ventricle. The cerebro-spinal fluid may then flow from the lateral to the third ventricle and from the third ventricle through the new opening to the normal fluid chambers below the base of the brain. The cerebro-spinal fluid then flows up and over the surface of the brain where it is reabsorbed into the bloodstream.